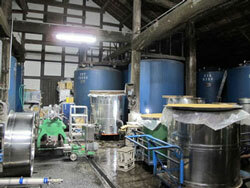 Situated in the valley along the Tama River, Ozawa Shuzo is one of the oldest sake breweries in Tokyo. Since its foundation in 1705, it has been brewing high-quality sake using selected rice and spring water of the Okutama Valley. The large brewery has a sizeable garden spreading along riverside where a restaurant, museum and souvenir shops are located. You could enjoy the area for hours by hiking along the beautiful riverside. Having made a reservation, I was able to join a free 30-minute guided group tour and checked out how the majestic brewing facility, with a gigantic wooden store house and wells with spring water, brews quality sake. At the last stop of tour, we sampled sake “Sawanoi pure rice.” The well-mellowed sake was very smooth and tasty with a wonderful aroma that reminded me of the clear current of the Tama River. After the tour, I went down to the riverside garden and bought some sake to go and enjoyed the mellow flavor with a handmade sweet-bean bun while watching green water and suspension bridge over the river. 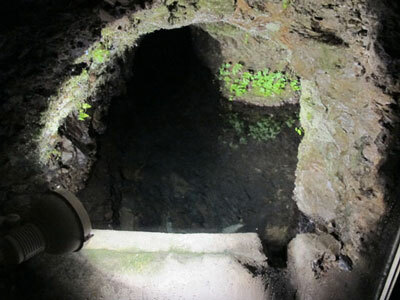 The cave to the source of spring water used for brewing quality sake. There are two springs within the brewery.